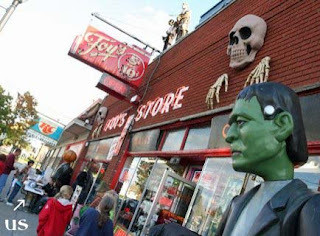 I had a crazy busy evening last night at a book signing at Foy's Halloween Store in Fairborn, Ohio. Foy's operates 6 unique stores filled with Halloween props, decorations, and costumes. Amazing Halloween props line the street and tower above you on the rooftops. Our tables were right next to two large gorillas and people stopped all night to take a snapshot of their family and friends hanging out with these beasts. 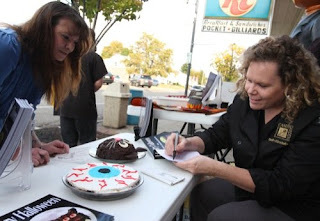 The evening began quietly as my friend Terri and I passed out samples and I signed books. When the sun sank, the music began to play, a hearse pulled up in front of us, Dr. Creep, a Dayton area television icon, arrived to sign autographs, and the crowds swarmed the streets in search of that perfect Halloween item. Happily many found my cookbooks to be that perfect Halloween item. Thanks to everyone who stopped out and purchased a book. I met so many interesting people and was thrilled to hear so many customers had found this blog and were using my recipes and ideas to plan their parties this year. One family told me all about the party they were planning based on my Dead Man's Diner theme. I could hear the enthusiasm in their voices and see the excitement in their eyes. I hope they have a fantastic party and will send along some pictures. I'd love to see pictures of any party using my ideas. I will be back at Foy's again tonight from 5:00 p.m. until 9:00 p.m. Stop out an see me, if you live in the area. I'm also going to be doing a cooking segment on the Fox 45 morning show on Friday, October 22nd at 8:45 a.m. 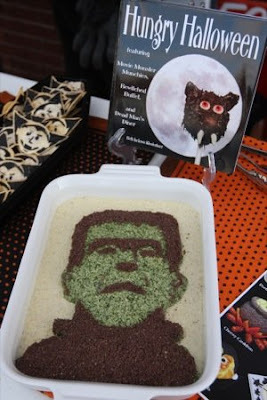 I'll be demonstrating how to make the vampire chips that are pictured on the left. I am working on a new recipe, and will post it as soon as I can come up for air. To see more pictures from the event, including pictures of Foy's store and props, click this link. Thanks to E.L. Hubbard for taking so many photographs of the event for the Dayton Daily News.